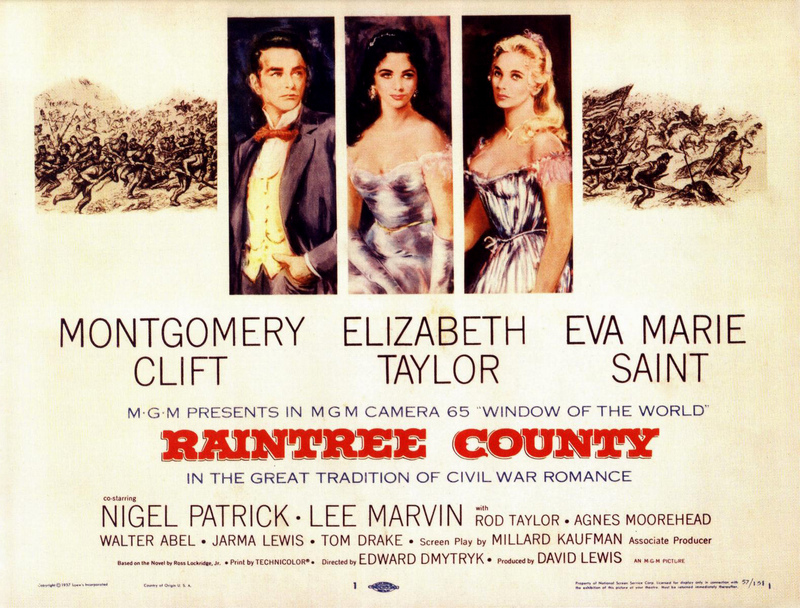 On the cusp of the Civil War, an aspiring writer (Montgomery Clift) with plans to marry his childhood friend (Eva Marie Saint) becomes smitten with a southern belle (Elizabeth Taylor) whose troubled background continues to haunt her. Edward Dmytryk’s adaptation of Ross Lockridge Jr.’s bestselling novel is perhaps best known as the film featuring Montgomery Clift both before and after his disfiguring car accident. Unfortunately, it’s a rambling, thematically dubious film which never settles on a satisfying story arc and fails to engage. Clift’s performance seems dialed in (small wonder, given what he was going through), and it’s hard to figure out (or care much about) his character. Meanwhile, Taylor over-emotes like she’s in a Tennessee Williams play, and the narrative threads about her mental instability, her attachment to creepy dolls, and her obsession with racial “purity” make it awfully difficult to sympathize with her. Eva Marie Saint has a thankless part as the beautiful small-town girl who is shoved aside by Taylor’s insistent charm, and Lee Marvin, Agnes Moorehead, and Rod Taylor are all underutilized as well. There’s little to recommend here other than fine cinematography. No. Skip this one unless you’re curious. Not must-see. First viewing – that is, the first in which I was somehow (barely) able to make it to the end. I had made previous attempts but had given up each time. My, this is a meanderin’ and turgid li’l thang, ain’t it? One can only wonder at the real reason for its existence. MGM may have had the misguided notion that enough years had gone by and that audiences were likely to be hungry (?) for another version (sort of) of ‘Gone With the Wind’. They would have been better off simply re-issuing ‘GWTW’ – which is eventually what they did in the early ’60s. That’s how I recall first seeing ‘GWTW’ in a theater when I was a child. Most of what is on display here is the filming of a tepid script. There’s little that the talented Dmytryk (or anyone) could have done with it. Dmytryk tries his best – and manages to pass the film off as …well, respectable, I suppose. But there’s never much of a pulse throughout. Oddly, I don’t feel that Clift’s performance is “dialed in”. Considering his awful misfortune during the shoot, he seems (to me) to deliver one of his better performances – commendably lending conviction to a role that hasn’t much depth. On the other hand, poor Taylor is simply at sea – but, as written, her character is all-but-impossible to play. It’s hard to determine what might have helped her to be believable – if she had given in more to the thread of madness, the film might have been stretched close to another hour! The worst comes at the end – when we’re not at all sure how exactly she kills herself. We’re led to believe that …what? …she dies from a case of simply becoming too tired to walk in a swamp?